I’ve long wondered about the mysterious woman named Sally Hansen whose name is used by ubiquitous drugstore nail polish brand. I’d assumed the company had been started by a Sally Hansen, but there was never any information about her online, even on Sally Hansen’s official site. There were even tidbits online mentioning that such a person never existed. Late last year, Sally Hansen updated us all with the story. The mysterious first lady of drugstore nail polish is revealed to be Sally Genevieve Hansen (née Finney) of Kansas, born to a couple who also happened to own a small cosmetics company. As a young woman, she moved to Hollywood, where she worked as an actress and a dancer, and wrote a column for the Los Angeles Times on the side. Later, she moved back to Kansas and helped her family to expand their company. This success led to additional cosmetics work with a department store, S. H. Kress & Co., and eventually Hansen moved to New York City, where started her own eponymous beauty company in 1946. The famous “Hard As Nails” line was one of her company’s first trademarks. She sold Sally Hansen Inc. in 1962, and sadly, passed away a year later. I love learning bits of nail polish history! Before I start, did you guys realize that Sally Hansen has changed its logo? I just noticed it when I was adding new shades to the Nail Polish Library; it’s only changed on the US site for now. The polish bottles all still seem to sport the old logo, as well. Anyway, when Rexall recently ran a Buy 2, Get 2 Free deal on nail polish, I decided to pick up four Sally Hansen Color Therapy polishes, since they looked so pretty in a special display of rose and coral shades. I thought they might have been new shades, but they were from the original launch in 2016. This is a coral orange with a small dollop of yogurt and a good handful of golden shimmer stirred in. It goes beautifully with that rose gold cap, doesn’t it? 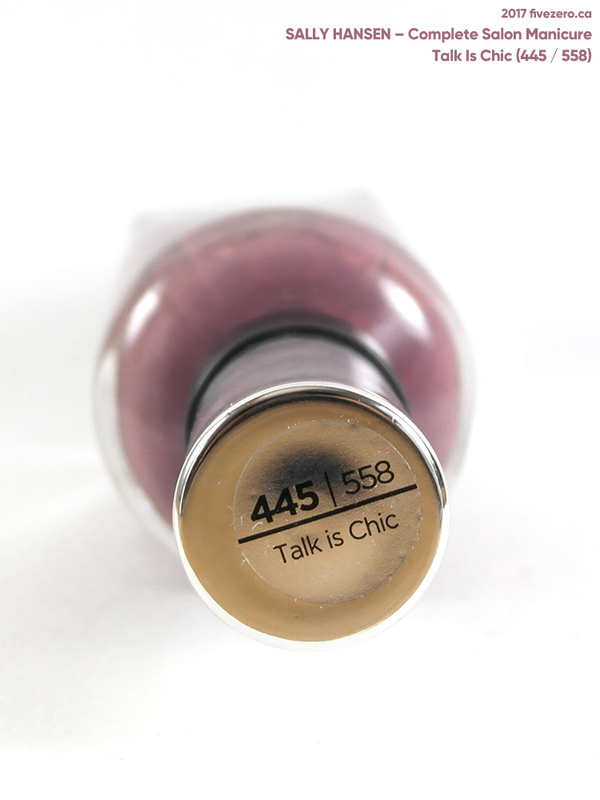 Talk Is Chic (558), from Sally Hansen’s Complete Salon Manicure line, was released last year in a collection of fifteen Canada-exclusive shades. The whole concept is a bit odd to me! Why not release the shades for everyone? The shade is a deep, smoky plum cream. It goes on the nail quite a bit darker than how it looks in the bottle, which was a surprise. Not vampy in the bottle, vampy on the nail! As usual, I am not a fan of the Complete Salon Manicure stem, and this shade is no exception. My particular brush seemed ever so slightly less badly-cut than some of the others, however, so I had less trouble applying Talk Is Chic. The formula is pretty good, and I got close to full coverage with two coats: not shabby for a vampy. A third coat might be preferred, but two are OK.
At some point, I have to try swapping out the CSM brush with a superior one, and seeing if that changes my opinion on these polishes. This line has some gorgeous colors, but it’s so let down by a poor brush, in my opinion. Don’t be fooled by the swatch above! Today’s shade is Black and Blue (580) from Sally Hansen’s Complete Salon Manicure line, and it’s actually a very sheer topper. The photo above shows one coat of Black and Blue over two coats of Tropic Thunder, a vampy blue cream from the same product line. Here’s the bottle of Black and Blue. It’s a very sheer, light teal blue shimmer with purple iridescence. Gorgeous, right? 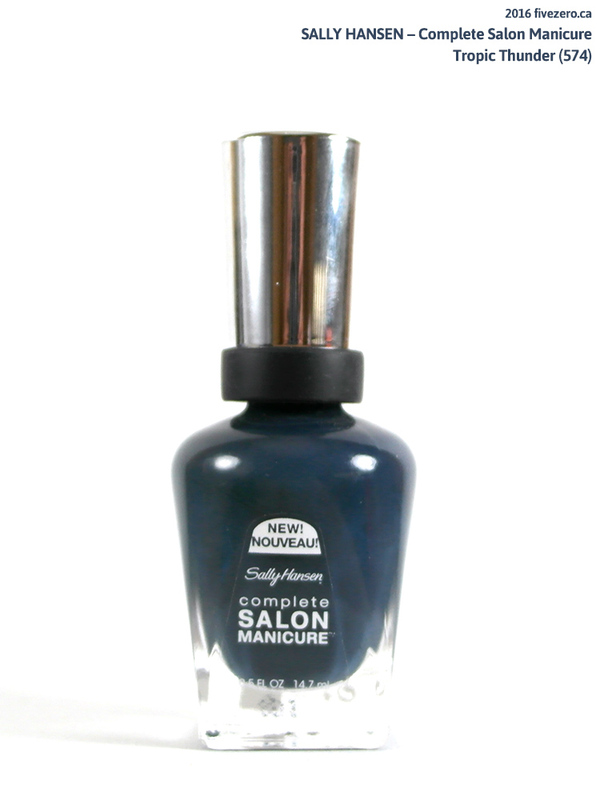 Sally Hansen Complete Salon Manicure in Black and Blue. Sally Hansen’s website shows a number of new colors in their Complete Salon Manicure line that are Canada exclusives. Today’s shade is Tropic Thunder (574), one of these exclusives. It’s a deep, slightly dusty navy blue cream. Sally Hansen Complete Salon Manicure in Tropic Thunder (Canada exclusive). 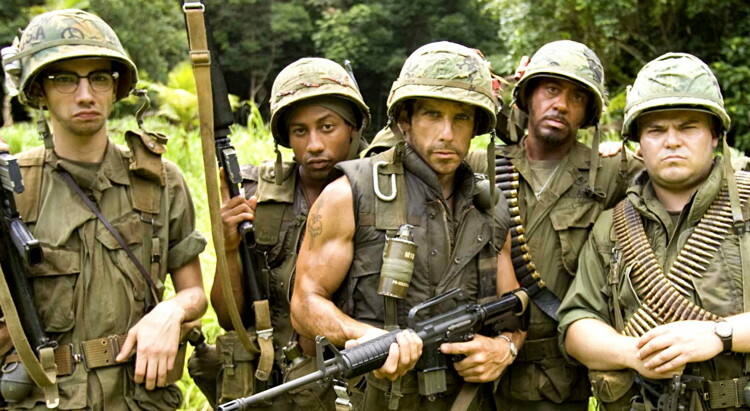 Tropic Thunder (2008) with Ben Stiller, Jack Black & Robert Downey Jr.